Shop the best ear piercing tools for your store! 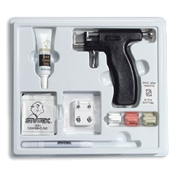 You'll find toolkits, with guns, skin lotions and sterilized & starter studs. Find the best pieces for your customers, all available at affordable prices, thanks to our wholesale deals!